Tradition has it that for centuries there has been an ancient trackway which runs from Bideford in North Devon and Dartmouth in South Devon. The purpose of this route was for sailors to travel between the two ports when transferring from one ship to sail on another, hence the name – The Mariner’s Way. 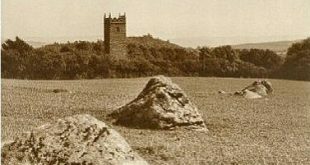 Numerous Dartmoor writers have acknowledged the track and some have even tried to follow its route but still today there is no firm evidence for the existence of The Mariner’s Way apart from faint echoes in the traditions of Dartmoor. Probably the most detailed study of the track can be found in Eric Hemery’s book – Walking Dartmoor’s Ancient Tracks where he has devoted the first chapter to it. (pp. 21 – 39). Even he concludes by saying: ‘the Mariner’s Way was never a through track but a linking together of countless old field paths to form a satisfactory route when first the need for one was felt. And who is to say when that was?‘, (1986, p.39). This old route is thought to have passed down the eastern flank of Dartmoor in a virtually straight line between Bideford and Dartmouth with the odd deviation that avoided crossing the North Moor and the huge dome of Hambledon. Groves (1977, p.194) that after leaving Bideford the route went via; the Torridge valley, Great Torrington, South Zeal, Throwleigh, Gidleigh, Hurston, Jurston, Widecombe, the Dart Valley, Ashburton, Totnes and finally ending up at Dartmouth, (for Hemery’s route see opposite). He, like Hemery, also agrees that the Mariner’s Way: ‘was not a trackway existing in its own right but simply a route which used roads and lanes where possible and elsewhere picked out a way across fields‘. In 1573 Bideford recieved a charter of incorporation from Queen Elizabeth I, this was instigated by Sir Richard Grenville who at the time was involved in the colonisation of Virginia and Carolina. It did not take long for trade routes to be established between the new colonies and Bideford, especially with regards to tobacco. By the 1720s Bideford and Barnstaple were considered to be the two largest tobacco ports in England. In the 1600s a flourishing trade in the import of Spanish wool for the Devonshire textile industry saw Bideford grow in importance and this was later expanded with wool coming in from Holland, France and the Mediterranean. The year 1663 saw the erection of Bideford’s first quay which was built by the local corporation, this was a sure sign of the ports prosperity. By the end of the 1600s the port of Bideford had also acquired a large share in the trade between England and Newfoundland and in 1699 more ships left here for Newfoundland than any other port except London and Topsham, (Hoskins, 2003, pp. 208 & 336). This very short history of maritime Bideford shows how during the 17th and 18th centuries the place had become a bustling maritime centre which would need a large number of sailors to man the outgoing ships. The importance of the deep water and sheltered harbour at Dartmouth has been recognised sine the 1100s when it became the departure point for the Second and Third Crusades. By the mid 1100s Dartmouth had become a busy commercial and military port with all of the cloth trade from nearby Totnes leaving there. During this period a flourishing wine trade had also grown up between Spain and France further adding to the prosperity of the town. After a sharp down-turn in fortune Dartmouth once again began to prosper in the 1600s with the development of the Newfoundland fishing trade and the cloth trade from nearby Ashburton. In 1604 the town was formally incorporated and to serve its new found wealth a large new quay was built to service the many incoming and outgoing ships, (Hoskins, 2003, pp. 383 -383). As with Bideford, Dartmouth would also need a constant supply of seamen to man the numerous ships. Having now seen that both ports of Bideford and Dartmouth needed an constant supply of seamen it could be suggested that there would be good reason for any sailors looking for work to travel between the two maritime centres. In that case, over time it is quite possible that a recognised route became established along which the men could travel. Hemery, (1986, p.22) estimates that the distance between Bideford and Dartmouth is about 70 miles, by using today’s modern roads Autoroute calculates that the distance is 68.4 miles. It is also interesting to see how closely this computerised modern route follows that of Hemery’s suggested trackway, (see below). Clearly there is no way any able-bodied seaman could travel the 70 odd miles in one day and so perhaps there could be some evidence of the Mariner’s Way in the form of overnight accommodation stops. Hemery, (1986, p.22) offers the notion that maybe the old medieval longhouse of West Coombe, near North Bovey (OS grid ref. SX 70930 82518), was one such place: ‘The farm, approached by stile and steps over West Coombe Stream, is a fine example of a medieval longhouse where the Mariner’s Way actually passed through the central passage of what surely was a rest-house‘. West Coombe, according to Autoroute, is 39.8 miles from Bideford which would place is roughly halfway along the journey. Sadly there is no clear evidence for this and so it along with the Mariner’s Way must lie in the ambiguity of Dartmoor tradition. In 1601 the Poor Law Act made every parish responsible for helping those in hardship whilst passing through their bounds which usually meant a cash handout. In the church accounts for the parish of Gidleigh there appear two entries where such aid was given: ‘Gave a sailor that had a pass 1sh – 1744‘ and ‘Giv’d alms to sealor 6d – 1760‘, (Grumley Grennon & Hardy, 2000, p. 28). The church accounts of South Tawton in 1670 show three similar entries with maritime connections: ‘Again to two seamen as shewn by their certificates suffered shipwreck – 2s 6d‘, ‘Given to James Wallis and his family having had Losses at Sea by the Turks and Ransoming of some taken by the Turks – 2s 0d‘ and ‘Gave Richard Phillips and Samuel Jones lately come out of Turkish Captivity in their distress – 1s 6d‘, (St. Ledger Gordon, 1954, pp. 44 – 45). Once again these entries do not prove the existence of the Mariner’s Way but what they do confirm is that sailors and seamen during the 1600s and 1700s were travelling through the moorland parishes where the route is supposed to have gone. On Dartmoor a good indicator of an ancient trackway is the presence of old granite wayside crosses that stand along its route, these would have provided guidance and possibly assurance to travellers. In the case of the Mariner’s Way there is but one example, namely Leeper or Liapa Cross. Today this stands by the gateway of Moorgate which was originally Leeper/Liapa Farm and stands at the intersection of what was the Exeter to Tavistock road and the Mariner’s Way, (Starkey, 1989, p.63). For such a supposed long and well established route it does seem strange that there are no more crosses along it way, granted some of them could have gone missing but even so in theory there should be more. In the case of the Mariner’s Way one tradition has led to a legend in the form of a tale which relates how a moorland shepherd whilst out tending his flock came across the decomposing corpses of a man and his dog. The remains were said to be those of a sailor who was travelling along the Mariner’s Way and for some reason became hopelessly lost. This story inspired the poet N. T. Carrington to relate the sad event in verse – The Sailor’s Fate. Hoskins, W. G. 2003. Devon, Chichester: Philimore and Co. Ltd.
Groves, R. 1977. Roads and Tracks, Dartmoor – A New Study, Newton Abbot: David & Charles. (pp. 193 -194). Grumley Grennon, T. & Hardy, M. 2000. Gidleigh – A Dartmoor Parish Past and Present, Gidleigh: Glebe Publishing. St. Ledger Gordon, D. 1954. Under Dartmoor Hills, London: Robert Hale Ltd.
Starkey, F. H. 1989. Dartmoor Crosses and some Ancient Tracks, Privately Published.